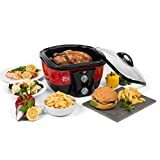 Instant Pot Duo 7-in-1 24 hour start delay – Keep warm technology – Healthier eating – Easy to use Mid range VIEW PRICE HERE! Pressure King Pro 12-in-1 Quiet operation – 12 cooking programs – Free utensils – Automatically adjusts heat Affordable VIEW PRICE HERE! Tower T16004 One pot cooking – 5 litre capacity – 3 year guarantee – 24 hour keep warm Affordable VIEW PRICE HERE! Buying Guide For All Types Of Cookers. 1 Buying Guide For All Types Of Cookers. A good cooker can be a boon to almost any kitchen, but it’s essential that you make an informed choice about cookers that are right for you — one that’s easy to use and boasts all the features you need can make a world of difference to your cooking. Slow, rice, multi cookers and electric cookers . . . with this helpful buyers’ guide, you’ll be able to steer your purchase in the right direction, and ensure you get the best out of your choice of product. Crock-Pot Digital 4.7 Litre capacity – Automatic keep warm feature – Dishwasher safe pot – 2 cooking settings Affordable VIEW PRICE HERE! Morphy Richards Accents Multiple heat settings – Free recipe book – Toughened glass lid – Large 6.5 Litre capacity Affordable VIEW PRICE HERE! Andrew James Cool touch handles – Large 6.5 Litre ceramic bowl – Multiple heat settings – Clear viewing glass lid Affordable VIEW PRICE HERE! Understandably, one big priority is money if you’re in the market for a new slow cooker. There are hundreds, even thousands out there — the trick is finding one that really stands out among others in your chosen price range. Not everyone has the cash to splash on a cooker worth upwards of £100! But rest assured that they tend not to be too pricey, at least not compared to other kitchen appliances — and of course, cheaper models can outperform break-the-bank cookers in many ways. Of course, there’s a general trend in that the more you pay, the more features you’ll probably be getting. Seven-in-one, multi-function slow cookers aren’t unheard of, and steam racks, UK and EU two-in-one power cables and microprocessor-controlled temperature settings are just a few of the fancy gizmos you could be spending your money on. If that doesn’t appeal to you — well, there are plenty of simple and straightforward slow cookers out there at prices that are practically a steal. While it’s fairly straightforward to gauge how much physical room there is for a slow cooker in your kitchen, the range of sizes can be daunting. From teeny-tiny 1.5-litre capacity cookers to hefty 10-litre models, it can be difficult to tell what’s right for you — especially as a slow cooker works best when it’s more than half-full, but many of them realistically can’t be filled too near the top. Many recommend buying two cookers, a small and a large one — one, for example, that keeps sauces and the like warm, and one for cooking stews and similar dishes. A good idea, since you can use both at the same time if needed. But if you don’t have the cash on hand for such extravagance, it could be a good idea to go for the largest one your kitchen allows — if you only occasionally cook small amounts of food, some models allow you to put an oven-safe dish in the bottom of a larger slow cooker. Plus, a two- or three-litre cooker might be perfect for a household of one or two; if you often entertain guests or have a larger family, it’s worth investing in a bigger model — we recommend a minimum of six litres — by all means. Slow cookers generally come in either a round, a rectangular or an oval shape, the former being much more common. The oval-shaped models of cooker are great for preparing large cuts of meat — some can even fit whole chickens! If this isn’t something that you want to incorporate into your repertoire, and prefer to prepare curries, stews, soups and the like, you’ll be better off plumping for a round cooker. An oval cooker, however, can be helpful if your workspace is limited, as it is possible to put it towards the back of the kitchen counter and still have plenty of room in front of it. Any slow cooker worth its salt needs to have at least two temperature control settings: high and low. Low, medium and high is preferable. Some of the fancier ones have up to ten settings, all ranging from very low temperatures to very high ones. They may be named for the dish they’re best used to make, or — more commonly — for the numerical temperature they work on. The disadvantage of this is that if you don’t know exactly what heat you want to be cooking at, a multitude of settings can get confusing fast. But if you’re a more experienced chef who’s interested in having a wide range of cooking styles at their disposal, a cooker with multiple settings might be right for you. Each setting tends to be best for cooking different foods. A high setting is ideal for white meats like chicken, maintaining it at a slightly higher temperature and generally being done within three to six hours, while a low setting that takes around ten hours is perfect for cooking cheaper cuts of red meat, as it efficiently breaks down the gristly connective tissues — a good guideline is that the more active the muscle, the more it will benefit from being prepared in a slow cooker. It’s definitely worth doing some research into the types of meat you’re planning to cook — although many vegetarians and vegans find that slow cookers work well for them, too, for preparing pulses, beans and the like. Many models, even ones on the very cheap end of the scale, now have a ‘keep warm’ setting — perfect for keeping plenty of heat in a dish after it’s fully cooked. This is an investment we’d recommend you make if you’re out of the house for longer than it takes a recipe to be prepared — it’s just so convenient! Auto cooking, a setting offered by a good few high-end models, generally means that the meal will start cooking on a high heat for an hour, then drop to low for the rest of the time. This is a popular way to cook plenty of different meals, such as meat stews, when not using a slow cooker — so it’s definitely an option to consider if you cook a lot of similar dishes. A manually controlled slow cooker will turn on at your command and keep cooking up until you turn it off — which, for many people, is all they need from their cooker. Leaving a dish on a keep-warm setting overnight, for example, simply requires you to turn the cooker on before going to bed and turn it on again in the morning. Nowadays, however, many slow cookers come with programmable digital controls, which allow you to schedule how long food is to be cooked for, and even when the cooker should turn itself on and off. If you’re busy out of the house or simply have a lot to attend to throughout your day, these controls can be an invaluable addition to your kitchen — once the timer has reached the previously designated cooking time you’ve set, it will switch to a keep warm setting that means your food will be ready when you are. Of course, the manually controlled cooker reduces the risk of something going very wrong if there are ever any malfunctions. Power interruptions, no matter how short, will completely reset a digital cooker and stop the cooking process entirely, whereas a manual cooker will simply continue in its stride if its power source is briefly interrupted. While this offers lots of control and flexibility, keep in mind that programmable digital controls can tip the price of a slow cooker up quite a bit. If you’re interested in an automatic on/off function but don’t have the cash to splash on a programmable cooker, there are innovative ways to get around this — you can plug a manual cooker into an appliance timer, which are inexpensive themselves, and set it to turn on or off as you wish! Most slow cookers come with a removable lining known as a ‘crock’ to make washing up easier; this can also be used to serve food in. Crocks are generally ceramic, which means they should be gently handled to avoid breakages; there are also aluminium non-stick models out there, which can be useful depending on the dish you’re making, but do not provide the same guarantee of constant and very even cooking that stoneware does. However, they’re great for browning meat to perfection! Those who prefer not to cook with aluminium can, of course, opt for a different material. A good crock should feature a fairly wide rim which slopes inwards, allowing any condensation that accumulates there to drip back down into the cooker. An indicator light function, found on some higher-end models, can be extremely helpful for anyone, no matter whether you have difficulty with accessibility — sometimes, it can be hard to tell whether cooking has started, as slow cookers can take a while to warm up depending on the model. Of course, you’ll want to look at reviews to see how quickly any model heats up to cooking temperature. If you have limited counter space, it is important to consider buying an insulated model, as you don’t want to get accidentally burned when your hand brushes the cooker. Smaller slow cookers will be easier to store, and some even come with extend-able leads or specialised travel packaging; others, meanwhile, feature hinged panels that you can open and close if you often find yourself juggling several implements while cooking. Silicone-wrapped handles can keep a cooker nice and cool to the touch, and some higher-end models are even starting to feature touch-screen displays for their digital programming! A dishwasher-safe lid or pot (or both) can make a slow cooker even more useful for those with busy schedules. Lids for slow cookers tend to come in glass, plastic or metal; a glass lid is probably your best bet, because not only is it heavier — keeping more heat in — but it allows you to check on the food without lifting it. If you’re a worrier, you can significantly reduce the cooking time by lifting the lid to check on a dish all the time! Glass may, of course, be too expensive — if that’s the case for you, then transparent plastic should be your port of call. Some lids, usually belonging to the more expensive models, have an extra component known as a gasket, which helps to keep in plenty of heat and prevent spills. However, some prefer a lid without a gasket, for easier cleaning — slow cookers do need a lot of it. Keep in mind that they have a tendency to absorb odours, too. A slow cooker uses much less power than an oven — when roasting a cut of meat, for example, the slow cooker’s average of around 250 watts beats out the oven average of 700 watts by miles. Nearly all the slow cookers manufactured nowadays have elements on both the sides and the bottom, which spreads out the heat for a tasty all-over cook — providing more coverage than many oven models today. Considering that you can buy cheaper cuts of meat that tenderise perfectly well in a slow cooker, it’s also a great way to save some money! As with slow cookers, you need to think about how much usage you’re really going to be getting out of a rice cooker. Since they’re highly specified for just one job — namely, cooking rice and keeping it warm when it’s done — it’s important that you consider how often you actually do so, and whether you want to make a big investment. If rice is an integral part of your diet, then by all means, splash out on a £400 rice cooker. But if you don’t have that sort of cash to throw around, you can find cheaper models for as little as £20; sure, they won’t have a million different features, but they’ll do the job just right! There are a lot of different brands of rice cooker out there — they probably run into the thousands. While many reviewers vouch for Japanese models as the pinnacle of rice cooking, others contest this. And after all, you may not be looking for a top-of-the-line model — most people just want a rice cooker that works for them! Let’s take a look at the different specific types there are. Conventional rice cookers, which, like all rice cookers, have an inner pan and an outer one, require only that you add rice and water and push a button — they’re the epitome of simplicity. Ideal for cooking white rice, they may not be your best bet for brown rice or sushi rice. Micom rice cookers — the name is short for ‘micro-computerised’, so you can infer that there’s more advanced technology at play (and correspondingly it will cost more to buy one of these) — come equipped with a clever little computer chip that adjusts temperature based on its internal and external thermometers. Let’s say that your kitchen is warmer than usual; with a micom rice cooker, this will be compensated for by slightly lowering the cooking temperature, resulting in a well-done dish every time. These are also known as ‘fuzzy logic’ technology cookers. It’s great for all types of rice, cooking them perfectly. Some fuzzy logic rice cookers also boast induction heating technology — making them more expensive, but ensuring that the rice is very well-cooked all over. Induction heating also allows for more accurate temperature adjustments — and alters the cooking temperature instantaneously to compensate when changes are detected, rather than taking a minute or two to cool down or heat up. For serious cooks, this is a must-have. Right at the top of the scale are the rice cooker models that feature the triad of fuzzy logic, induction and pressure-cooking; the last of these technologies raises the temperature inside the cooker, altering the structure of the starch in the rice and meaning that it cooks faster, becomes fluffier and easier to digest, and can be kept for longer. Of course, you can also get rice cookers that feature these cooking styles independently, too. A word of advice: if you enjoy cooking all sorts of different rice types, like quinoa, brown rice, risotto or sushi rice, a rice cooker that at least features fuzzy logic technology is your best bet! The capacity of a rice cooker is measured in cups of uncooked rice, which — and this is a very important detail — fluffs up and soaks up water when cooked to approximately double its uncooked size. This means that if you put in two cups’ worth of uncooked rice, it will expand to four cups of cooked rice. Now, one of the most important considerations to take is how many people you’re going to be feeding regularly with your rice cooker. A single- or two-person household will do just fine with a three-cup cooker, while a large family might be better served by one that can hold eight cups (anything that takes more than ten is generally only available for commercial purposes). One of the main reasons that people favour rice cookers over less specialised ways of cooking rice is that they are incredibly easy to clean; any rice cooker worth its salt needs to have a non-stick inner pan, which is an absolute breeze to soak and wipe down when you compare it to the hours of effort sometimes needed to completely scour a normal pan of leftover rice. Make sure you get a model with a non-stick pan if you value your time — most have a plastic or aluminium shell, while more expensive ones can feature stainless steel, which gives it great durability. You will also probably want a detachable lid for the inner pan, so that you can take it out and clean it separately — and a removable and washable steam vent won’t hurt. The very pricey models can even feature auto-cleaning — although this probably isn’t high on the list of most people’s priorities! A rice cooker with all the bells and whistles might seem intimidating, but could actually prove to be very useful in your kitchen — it all depends on what you’re using it for. Here’s a run-down of some of the more common features, and what you can get out of them. Some models of rice cooker feature an LCD control panel for ease of use and accessibility, which is great for quick reading. This also allows them to feature more settings — such as automatic cooking, which cooks rice on a high heat for an hour and then a low heat for the rest of the duration, reheating cycles and delay timers. Advanced digitally controlled rice cookers are being improved upon every day, and there are a fair few newer models which respond to voice prompts in a variety of different languages, as well as being accessible for status checks from Android phones! Many come equipped with a useful steaming tray or basket for steaming vegetables or white meats such as fish and poultry — perfect with rice! If you’re not bothered about this or prefer not to steam your food, then consider this feature a nice bonus, but not an essential and certainly not something you should splash out on. Some metals, such as aluminium and copper, can conduct heat better than, for instance, plastic; these may be options available for customisation of the inner pan, which reduces cooking time. Aluminium heats quickly but unevenly — this may be compensated for with induction heating capabilities — while stainless steel is even, but slower. A timer is a very convenient feature to have, allowing you to cook the rice at a set time for a set period; if you’re out of the house and you need to get some cooking done, rest assured that it’s as simple as inputting a few settings and coming back to a perfectly prepared serving or two of rice. Many of the Japanese brands of rice cooker have two different lines, one for domestic (in-country) sale and one for export. They will have different price points and qualities, since rice cookers sold outside Japan are often slightly adjusted to make up for different voltages in different countries (although for the UK and Europe, they don’t change this factor). Also, in Japan, where the living spaces tend to be much smaller, quality is prioritised — the country is known for its small, efficient technologies and gizmos. Our advice? If you want to be sure of the quality of the rice cooker you’re buying, get one that explicitly states it’s ‘made in Japan’. Tower T90103 6L Capacity – Phenolic Side Handles – Built in alarm – Detachable timer Mid range VIEW PRICE HERE! Tower T90101 Two step pressure valve – Stainless steel – Steamer basket & stand – 10 year guarantee Affordable VIEW PRICE HERE! 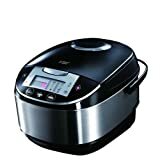 Morphy Richards Multiple safety features – Healthier eating – Long ergonomic handle – 2.7 Litre capacity Affordable VIEW PRICE HERE! Fancy pressure cookers with all the extra features can definitely be expensive, but the great news is that this isn’t necessary — you can certainly get a pressure cooker that won’t break the bank, but that will do the job. Like a car, inexpensive parts like gaskets will occasionally need to be replaced. That’s okay — it works out in the long run, and a good pressure cooker — preferably a name-brand one — can last you decades! You’ll want one that offers at least a ten-year warranty, though, so pick from reputable companies. The slightly higher cost is absolutely worth it. Pressure cookers generally come in two types: aluminium or steel. While non-stick aluminium models are lightweight and economical, and provide excellent all-over heating due to their high conductivity, they are not as durable as you might like; they also stain with use. While this doesn’t affect the quality of the cooking, you may want to avoid this. Non-stick coatings also don’t last all that well. Stainless steel pressure cookers are more expensive and heavier, but are much more durable than aluminium ones and keep their shine longer; however, the material is not known for its conductivity, so if you want a stainless steel pressure cooker, it’s a good idea to select a model that has a disc of aluminium on the outside bottom of the pan, ensuring all-over cooking and practically eliminating scorching. Like slow cookers and rice cookers, pressure cookers are sold according to their total liquid capacity. Depending on the food being cooked, however, the actual usable volume may be as low as half what’s advertised if the foods foam or froth up during cooking. Happily enough, you can use this buyers’ guide to determine what the right size for you is. A 4.5-litre pressure cooker is a great option for cooking whole meals for one- or two-person households, or if you’re only going to be cooking one course for a family. 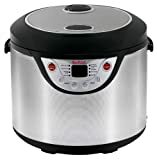 A 7-litre cooker, meanwhile, is the most popular size — most pressure cooker recipes are adapted for this capacity, and it’s perfect for somewhat larger families. It also allows you to cook larger dishes, like whole chickens or beef ribs, and makes it easy to fit in accessories such as dishes and cooking racks. But the heavyweight 9-litre cooker, which is great if you’re looking to make large batches of stock, is the best option for big families or entertaining a lot of guests! There are even larger volumes available, although for regular home use, they probably won’t pay themselves off in the long run. The gold standard for a pressure cooker is for it to reach 15 psi (pounds of pressure per square inch); the model you choose should be capable of this. An accurate indicator will also be very useful, as you don’t want to have to employ guesswork to work out when the right level of pressure has been reached. Pop-up indicators or coloured markers can be handy. If, like most people, you’re looking to cook complex recipes, you’ll want a pressure cooker that has a built-in quick-release option so you can equalise the pressure, add other ingredients and resume cooking quickly. Modern pressure cookers come equipped with safety features, unlike those of the past — no need to worry about explosions! If the cooker becomes over-pressurised, excess steam is simply vented through a valve. You’ll want to choose one with a cover-locking system to prevent pressure from building until the cover is fully locked, and locks it until the pressure is reduced. An electric pressure cooker is easy and convenient to use, while a stove-top model allows for more accuracy by manually regulating heat. With an electric model, you simply have to press a few buttons and leave it to cook, and it will automatically turn off and keep the dish warm when it’s done, which is what attracts most people to them. Electrics can also double as rice cookers and slow cookers, and many have a timer delay for busy cooks! Stove-top models, which require an external heat source, bring food up to pressure faster, and can immediately stop with what is known as the cold-water release method. They have longer warranties — ten years, as opposed to one with an electric model — and their replacement parts are much easier to come by. Electric models also only tend to reach 10 to 11 psi, whereas 15 psi is standard for a stove-top. Ultimately, the choice is yours, although we would recommend a stove-top model purely because of its lasting usefulness. Having all the ‘bells and whistles’ can seem like a waste of money when you’re buying a pressure cooker, but some of them can come in really handy. Here’s a quick rundown of a few of the most common extra features. Some pressure cookers feature multiple pre-programmed settings, allowing you to steam, sauté, sear and slow-cook — this is definitely handy for super-serious chefs, although the addition of these settings can really rocket the price up. An inexpensive add-on is a cooking rack, which will allow you to cook foods above the liquid and keep them separated from one another so the flavours don’t become muddled. Ergonomically designed, two-sided handles are always a plus point, as the pots with food in them can become very heavy and you definitely don’t want to accidentally drop anything! A colour-changing screen is boasted by some high-end models, switching between different LCD colours to let you know when it’s on and being programmed, and when cooking is in progress. Of course, with any cooker, there’s going to be a trial and error period — which is why we recommend that you take careful notice of return dates, warranties, guarantees and other buyer safeguards. However, making an informed choice is vital — and with all these factors taken into consideration, it won’t be too hard, either!